Pope Francis has paid a surprise visit to a centre for Alzheimer’s patients in Rome, as part of his Mercy Friday initiative. Source: CNA. 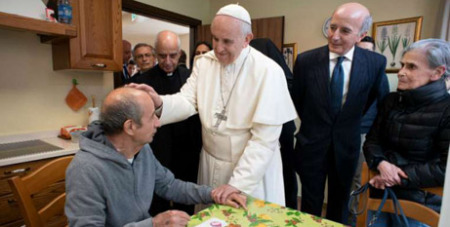 With this visit to the Emmanuel Village on the outskirts of Rome last Friday, the Pope desired to turn attention to the exclusion and loneliness Alzheimer’s disease can bring to patients and family members, who are often forgotten by society, according to a Vatican. “The continual increase in life expectancy also calls for greater awareness and respect for the needs and dignity of those who live this disease themselves and those who are close to the patient,” the statement said. When Francis arrived at the Emmanuel Village, he was greeted with astonishment by the staff and residents. He then toured the centre and spoke with patients as they engaged in their recreational activities. The Alzheimer’s center is known for its innovation in creating an environment for its patients that allows them to live as close to normality as possible. Each of the patient residences in the “village” is designed to closely resemble the individual’s home. Earlier this month, the Pope met with a group of Belgian Alzheimer’s patients, who perform together in a choir. “I think your song is made more precious by your vulnerability,” Francis told the 15-member choir who were in Rome for a five-day pilgrimage. “Perhaps some of them have lost their memory, but they are the symbol of the memory of a people; they are the roots of our homeland, of our humanity. They are the roots, and the young must go there to take the sap from the roots, to carry civilization onwards,” Francis said.